PINE MOUNTAIN CLUB, CA – Leave your troubles behind and travel to an oasis – only an hour or so north from Los Angeles. Pine Mountain Village, at the crest of the 5-freeway, has a unique venue that wine, beer, food and music lovers have enjoyed attending for more than a decade: Wine in the Pines. The event is on June 10 from 1:00 to 4:00 p.m., with a VIP entry at 12:00. 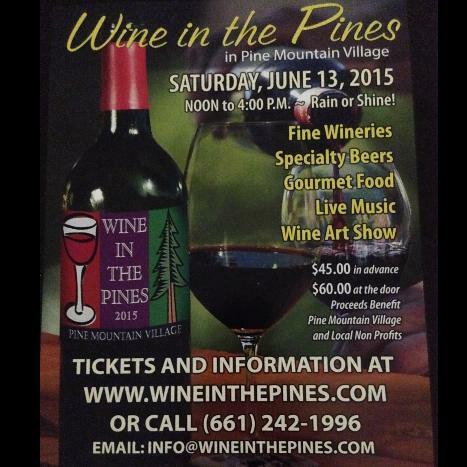 Proceeds from Wine in the Pines benefit the American Cancer Society. At press time winery participants include Ascension Cellars, Cass Winery, Cantara Cellars, Charles Wine, Enjoy Wine, Frolicking Frog Cellars, Flying Goat, Golden Star Vineyards, JFC International, La Montagne, Lapus Luna, Madd Bailey’s Wine, MM Organics, Mountain Ranch Winery, Opolo Vineyards, Pomar Junction, Ranchita Canyon Vineyard, Sagebrush Annie’s, Silkwood Wines, Stephen Hemmert Wines, Tobin James, Turiya, Vinestead, Vista Del Rey Vineyards and Workman Ayer. Wolf Creek Brewery, Tioga Sequoia Brewing Company, Firestone and Stella Artois are the craft beer breweries also signed up so far, while food vendors include Big Mike’s Ragin BBQ, Brazil Hot Dogs, La Lena Mexican Restaurant and Wolf Creek Restaurant. In addition to the wine, beer and food vendors there is always live music wafting through our woods – at least three bands! Information on cabins available for rent is also on the website: www.WineInThePines.com and there is a Holiday Inn located nearby. The Sta. Rita Hills Wine Alliance presented Pinot Noir, Chardonnay and other cool climate varieties at the Wine House in Los Angeles this past week. Guests were told not to “…miss this opportunity to catch up with old friends and meet some new ones and see what is up in the Hills!” And, in my usual form, those with short attention spans can get their fill in this 1 minute YouTube slideshow from the event. For a change, and because this was going to be a tasting of only a select group of winegrowers, I made an effort to visit every table…but I didn’t drink everything as some (Brewer-Clifton, Crawford, Clos Pepe and Longoria) I had recently tasted at other events and from home. I’d have to say that all, again for a change, were a hit with me. I may not have loved every wine from every winery but I did love at least 1-2 wines from most. This was a first for me. My takeaway notes from most are below. Sorry to the very few that I did miss! AVE Wines – Loved at a recent STARS tasting but this was my chance to try three “above 90 pointers” from their Pinot program. Well done. Brewer – Clifton – Already a fan of this rock star winemaker. Clos Pepe – I always love seeing the hard-working Andrew Turner with the Pinot that, in my opinion, put Sta. 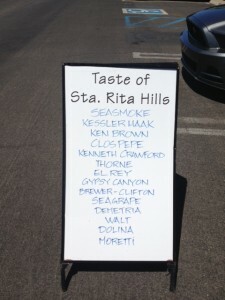 Rita Hills on the map. Crawford Family – Love seeing Mark Horvath, and his wines never disappoint as well. Fess Parker – Busy table with lots of great Pinots, as it’s been doing for years. Fiddlehead Cellars – Been a fan for a while, well done wines. Flying Goat Cellars– Loved the “Goat Bubbles” for its great fruit, cheese and toast notes. Foxen Winery – Nice Pinots, and killer 2014 Chenin Blanc. 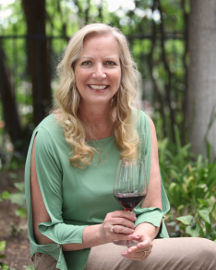 Hitching Post Wines– One of publicist Jannis Swerman’s favorites, her marketing helps me not to forget about this long-standing respected winery. Ken Brown Wines– Classic Pinots as usual: Encantada Vineyard and Rita’s Crown Vineyard were my choices. Kessler-Haak Vineyard – Fun 2014 Rose of Pinot Noir and a nice 2014 Chardonnay as well. And they did sneak in a bottle of 2013 Syrah that was great. Montemar – Followed wine pal Marla Hofstee to this table, plenty of vintages to try and enjoy. 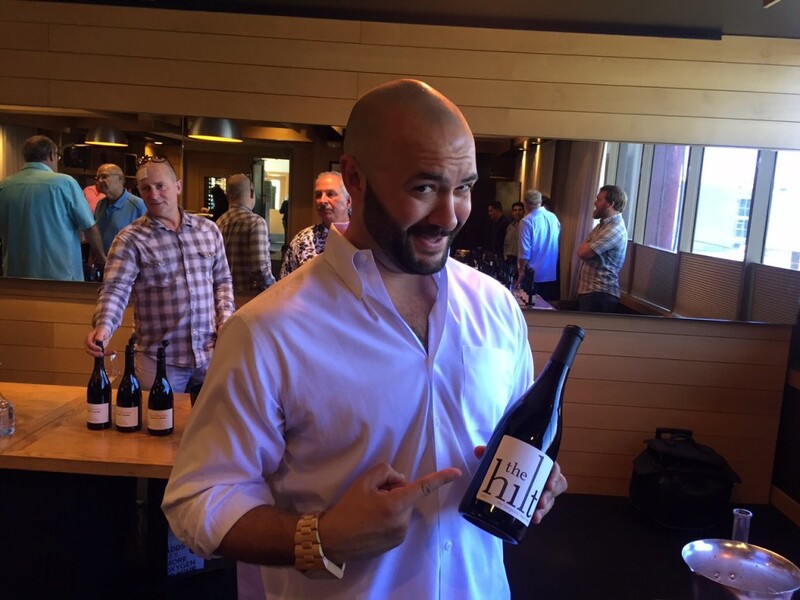 Pali Wine Company – Loved at least two of their Pinots: Huber Vineyard and Summit! Prodigal Wines – Had to agree with Wine Enthusiast: the 2013 Sta. Rita Hills Pinot Noir was well deserving of its 93 points. Purisima – Loved the Zotovich Vineyard 2015 Chardonnay! The Hilt – Their fun wine rep walked me through a few nicely made Pinots. Wan Fiore Project – The first table I stopped at, I recall liking the 2013 La Encantada the most. The winery name is a blend of the names of two brothers-in-law, one named Wan, the other, Fiore. What makes this guidebook different? The world-class photography? The work of no less than four award-winning writers? Recently I sat down with editor and publisher Tom Silberkleit, before his book-signing debut at Vino 100 Valencia event last month, to learn more. What makes your books the definitive choice for wine area planning? “Half the fun of visiting wineries is getting a real ‘sense of place’. When folks take a wine country holiday, their intention is to return home with good wine and good memories.” began Silberkleit. “Wine tasting is much more fun when you experience true hospitality and meet good people along the way. Our books focus on ‘destination wineries’, places with a secondary reason for the visit—in addition to good wine. I do the ‘prep work’ for my editorial staff. If a winery is producing good wine (of course, that’s the pre-requisite) and has beautiful gardens, award-winning architecture, underground wine caves, an on-site museum, world-class photo exhibits; a patio for picnics… that’s what I’m looking for. Places like this have something for everybody whether people in a group drink wine or someone chooses to abstain. I want readers who visit California wineries to feel that they’ve gone somewhere special. Wine country is very much like Disneyland for adults. I spend much of the year driving the state to research and taste. However, in selecting wineries for our books I never trust my palate alone. Everyone’s taste is different. 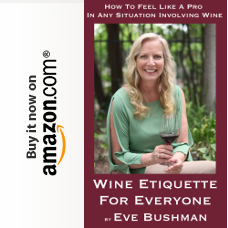 I confer with wine tasters who frequent tasting rooms and special events, wine writers, fine wine sellers, and, most importantly, winemakers themselves. It’s all in order to get a broad consensus on quality. My photographer and writers are top professionals in their fields. They have published works in various media and live right here in California’s wine regions. Tell me about the Quiz, that I lifted for my blog, on winery trivia, did one of your four writers make that up? As a teenager Tom signed up for a free correspondence course on the wines of France. Attending his freshman year of college in Europe further developed his palate. Later in life, his career as a writer turned to the promotion of California wines and wineries. Tom spent 27 years touring different places just in Sonoma alone while he wrote about his adventures in a local newspaper. Then, leaving the rat race behind, he started his own graphic design studio while simultaneously making a string of major book sales to such publishers as Doubleday, St. Martin’s Press, and Stein & Day. No less than 7 wines were partnered for the book signing that night. Lil LePore had arranged with Chris Rigdon, our newest rep in the area for TGIC Importers, to pour Halter Ranch Vineyard from Paso Robles—one of the wineries featured in the Central Coast edition of Tom’s book. I found out from Chris that Halter Ranch wines could only be procured from Vino 100. Guests were to taste a Rose, Sauvignon Blanc, Cotes de Paso Blanc, GSM (Grenache, Syrah, Mourvedre blend), Syrah, Cotes de Paso and Cabernet Sauvignon. As it was only 4pm, and I had another interview to conduct over wine that evening, I limited myself to only a few sips of the much recommended Rose, while chatting with Tom. Great ripe-strawberry color, a floral nose with drops of both honey and light fruit, a watermelon taste that was remarkable as was a little white pepper on the back palate. There are two editions of The California Directory of Fine Wineries currently available at Vino 100 in Valencia, Barnes & Noble, Borders Books, Amazon.com, and Southern California Bristol Farms stores. The Central Coast edition covers Paso Robles, San Luis Obispo, and Santa Barbara while the Northern Region book, now in its 4th edition, highlights the wineries of Napa, Sonoma, and Mendocino. PINE MOUNTAIN CLUB, CA – Can you imagine leisurely sipping wine and sampling gourmet food while listening to live music and perusing an art show – in the woods? And that scene will unfold just an hour or so north of Los Angeles in Pine Mountain Village at the top of the 5-freeway known as the grapevine. The festivity takes place on June 13 from noon to 4:00 p.m. Many of the guests that have come to Wine in the Pines for over a decade have discovered an oasis of fresh air, cabins, pine trees and wine lovers. Come see what all of the talk is about and join us for this year’s event. At press time participants include Freixenet, Clayhouse Wines, Pomar Junction Vineyard, Ranchita Canyon Vineyard, Silkwood Wines, Vista Del Rey Vineyards, Frolicking Frog Wine, Golden Star Vineyards & Winery, Cass Winery, Lapis Luna Wines, Quady Winery, Opolo Vineyards, Gen7, Ampelos Cellars, Transcendence, Montemar Wines, Zotovich Cellars, Sagebrush Annies, Casa Blanca Restaurant, Ascension Cellars, Las Flores, Plan B Wine Cellars, Veritas Tapas & Wine Bar, Tobin James Cellars, Madd Bailey’s Pub – Pine Mountain Club, Pali Wine Company, Hansen Grunner Vineyards, Rock Lobster Vineyards, Black bear Red chair, petite sirah, G. Washington, Stone Pine, tercero wines, Wolf Creek Brewery, Tioga Sequoia Brewing Company and Advanced Beverage Solutions (Stella Artois). UPDATE These wineries are also now participating: Bellissimo Cellars, Mystic Hills Vineyard, Midnight Cellars Winery, Gagnon Cellars, Cantara Cellars, Turiya Wines, Bradley Family Winery and Vina Robles Winery. If you would like to explore the area and make a weekend out of it, information on cabins available for rent are also on the website: www.WineInThePines.com and there is a Holiday Inn located in nearby Frazier. The Wine Room Gallery Wine Bar in Pine Mountain will be open on both Saturday and Sunday from 12:00 to 4:00 p.m. and guests will be able to purchase and take some of the wine they tasted at the festival. 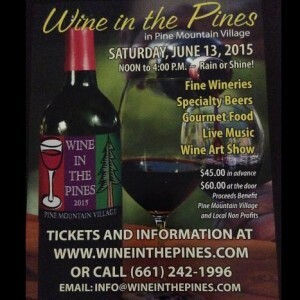 Tickets and information: www.WineInThePines.com, 661-242-1996 and Facebook. During a recent trip to the Lompoc Ghetto (see story in the Oct/Nov issue of Elite magazine) the first ghetto room owner that I interviewed, with 30 years of experience in the wine business, was Antonio Moretti. Then I watched and listened as Moretti described each wine, winery, winemaker, appellation…etc., of every wine he poured. The attention to detail, and his obvious passion to the task, were forefront. I could not help but comment that I had not experienced such devotion – to other winemakers – from the people that have poured for me in other winery collective tasting rooms. As I took diligent notes as Moretti spoke, my own tasting notes were lacking. If Moretti hadn’t been so interesting the case may have been opposite. But I believe you will gain more from his knowledge than my own meager one in comparison. But, as I couldn’t resist, I pulled out one descriptor for every wine I tasted that grabbed me – like an inkblot test and I wrote down the first thing that came to mind. Moretti Bianchetto, 2011: This is what Moretti drinks at home. He said it was light, dry, crisp and focused; and good with food. The grapes are picked earlier, which allows for the 12 percent alcohol. Moretti likes lower alcohol for two reasons: he can drink it throughout a meal and the wines have brighter acidity because the fruit was not overripe when picked. The bright acidity “keeps the palate clean.” All house wines are low alcohol in Europe, Moretti said, but as Americans want a glass of wine to stand alone there is traditionally more alcohol and less acidity in our wines here. My one descriptor: Lychee. El Rey Pinot Noir 2011: Susan and Derek McLeish own the winery. It is a small production farm in a micro climate area about a mile from the Sta. Rita Hills AVA border. They only give their Garagiste wines to the tasting room to sell, according to Moretti, whatever they haven’t consumed themselves. They have full bodied fruit from their vineyards, and the cooler nights creates a thicker skinned grape and darker colored wine. My one descriptor: Cinnamon. Seagrape Pinot Noir, Jump Up Vineyard, 2010: The winery has nothing to do with Buttonwood but Karen Steinwachs, the winemaker at Buttonwood, is the owner and sole winemaker at Seagrape. She used two to three year old barrels and blended grapes from two different vineyards in the Sta. Rita Hills. Moretti said the wine was both drinkable and age-able, and a typical example of a Sta. Rita Hills Pinot Noir. He said that the east AVA area makes a unique Pinot Noir that stands alone, while the western AVA needs food. 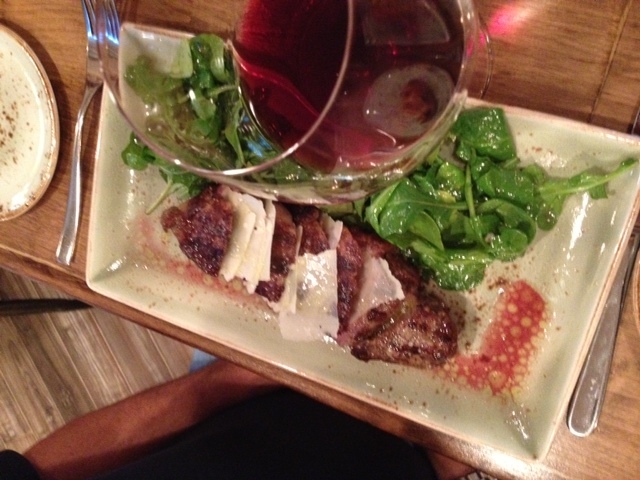 He added that this Pinot was a good pairing wine; and with duck or boar, the wine blooms. My one descriptor: Cherry. Ken Brown Pinot Noir, Sta. Rita Hills Cuvee 2010: Moretti said that this wine was good with food and could also stand alone as it was balanced, and grown from the warmer side of Sta. Rita Hills. Brown used 50% Rio Vista fruit (which gives the fruit-forward impact because it is warmer there), and the balance comes from two cooler weather spots – Rancho La Vina and Rita’s Crown. 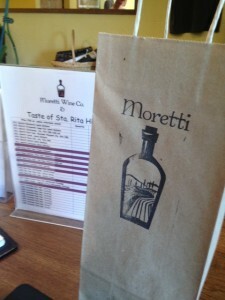 With 2012 Ken will be bottling a single vineyard Pinot Noir from Rita’s Crown,- and Moretti suggests we try that. My one descriptor: Cherry. Kessler-Haak Syrah, Lafond Vineyard 2010: Moretti said that they purchased the fruit from Lafond. As this one had higher acidity Moretti sent his assistant out to bring us back some Italian salami to try with it. The salami “reduces acid and the flavor pops” Moretti said. It would be good with BBQ or steak. A north Rhone style grape grown in cooler weather, again producing thicker skin and more pigmentation. My one descriptor: Red fruit. Cebada, Forbidden Fruit Libation: Cebada is a farm (Forbidden Fruit Orchards) in a unique micro-climate, and grows berries, bananas, guava, kiwi, Pinot Noir and Chardonnay. Moretti finds owner Sandra Newman’s port-style blueberry wine interesting winemaking – as it tastes like port. She aged the berries in French barrels, adds sugar and brandy (making it fortified) but no grapes. I thought this one required a longer one descriptor: needs-a-pancake. Gypsy Canyon, Ancient Vine Angelica, Marcelina’s Vineyard, Sta. Rita Hills: This is a fortified dessert wine, and according to Moretti it’s between a Madeira and a Sauterne. 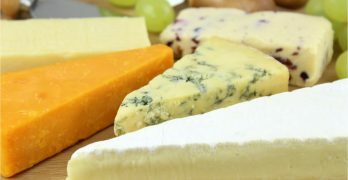 He suggested that we pair it with cheese. The Franciscans in the San Gabriel Mission began making this wine in 1771. My one descriptor: Intense. Taste of Sta. Rita Hills* is a wine tasting room and retail store located in the Lompoc Wine Ghetto owned by Antonio Moretti and dedicated to representing local producers who do not have tasting rooms regularly open to the public: The current list of wineries they represent are: Clos Pepe, Seasmoke, Brewer-Clifton, Gypsy Canyon, El Rey, Thorne, Ken Brown, Walt, Seagrape, Ryan Cochrane, Cebada Forbidden Fruit, Dolina, Kessler-Haak, Rarus, Kita’ and Moretti. Writing about wine tasting sometimes doesn’t always leave a lot of room for other important things, like where we dined and where we laid our heads at night. This article will cover that part – something very important to travelers whether wine is involved or not. Not so fancy to look at from the outside, and quite quaint and old-fashioned on the inside, it fit the bill fine. There was quadruple the parking compared to Solvang – although there are a few public lots you may still have a walk to a restaurant. 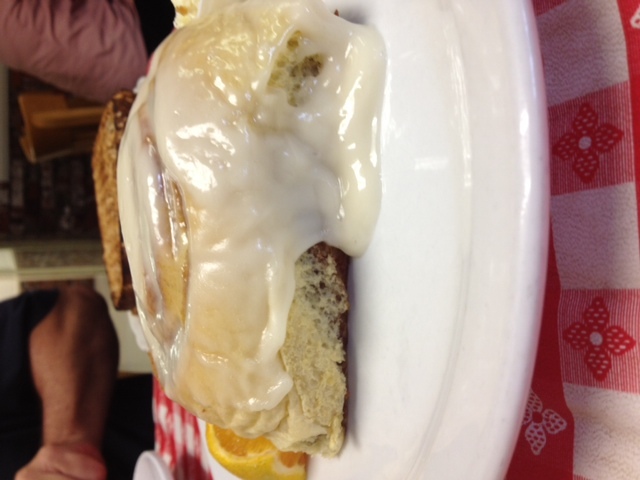 The wait is less too than in Buellton. We waited about five minutes before being seated; and immediately given coffee and menus. The menu was like the other Danish breakfast places with the thin pancakes that came with different fruits or meats, homemade cinnamon rolls, omelets, French toast and Belgian waffles. I had something called “Fat Bread” which were large slices of cinnamon raisin bread made in French toast style, and served with tons of sliced fruit. 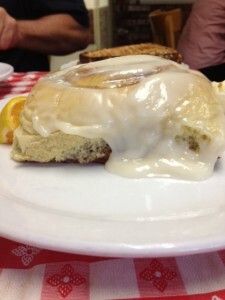 My husband had a Denver omelet AND the cinnamon roll. Service was quick, the crowd was friendly, the place very memorable in all. Will definitely be back. 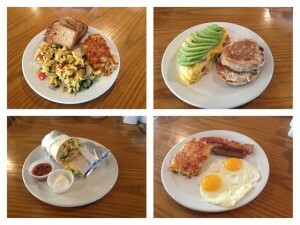 The perfect stomach-filling uber-tasty meal we needed before a day of winery appointments and no time for lunch! After five hours of wine tasting in the Lompoc Wine Ghetto the last thing I wanted to do is drive a minimum of 20 minutes for a hotel. 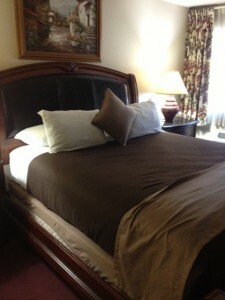 I chose O’Cairns Inn and Suites exactly for that reason. It was a three minute drive from the tasting rooms. Now I had a good two hours to rest before tackling dinner. The woman at the reception desk was extremely solicitous; seeing our tired faces she quickly explained where we could find the free ice cream, fruit, coffee, sodas. She then pulled out a map to show us where our rooms were located and where would go for our made-to-order complimentary breakfasts in the morning. Now, ten minutes later, we found our rooms, dropped our bags, oohed and aahed at the amenities in our suite: a larger flat screen then we have at home, a well-equipped kitchen, dining nook, a desk, large dresser, large bed and bath…and now I am sitting – with my feet up in a leather recliner – starting my 4-star review for Trip Advisor and Yelp. 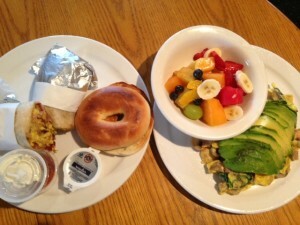 Fast forward to breakfast and I had everything my tummy desired before another day of wine tasting: Eggs scrambled with sausage, mushrooms, spinach, topped with sliced avocado and a large bowl of fresh fruit while my husband had an “everything” breakfast burrito, hash browns and toast. Note: This hotel, just like the Lompoc Ghetto, is not for the snobbish traveler anymore than it is for the elitist wine taster. These two pair well together and are perfect for the smart wine taster that is looking for cleanliness, comfort, hominess and convenience in their accommodations. After resting for two hours in our hotel we spruced up a little and made the 30 minute drive into Santa Ynez to make our 7 p.m. dinner reservations, again at a highly recommended Italian restaurant, S.Y. Kitchen. We drove up to a mid-size building that looked like it had once been something else; either a private home or a grocery. We walked up to a porch and then into the restaurant where the hostess seated us immediately. We were seated in what may have been the main dining room, in front of the open kitchen, but I regret not walking around to see the rest of the place. Our waiter was very solicitous. He listed every special from memory – and there had to be about six – while making eye contact with each of us as he went through each one. I got a kick out of watching him do this as he would turn from one of us to the other, and around again, knowing that his delivery was dead on enough that he couldn’t help but add a touch of a wicked smile. I half expected him to wink at each of us when he was done. Showmanship aside, he also gave swift service and checked in with us frequently. Every table started with a bowl with ice and crudités, served with small individual dipping bowls filled with olive oil and pepper. I thought it was a nice touch – allowing us to double dip with ease. We each ordered at least one of the specials. My husband had the New York steak that was served sliced and over a bed of dressed baby spinach, I had a duck ragu pasta, and our dining partner, Claudia Sheridan, had the fresh cream of asparagus soup. After we ate, and we were completely sated, our only regret was that we couldn’t find room in our tummies for the dessert. My husband did order a cappuccino, as this was an Italian restaurant, and it was excellent. We looked around at the other tables; families, couples, all out for a great Saturday night dinner. I believe that the owner or manager, he didn’t identify himself, checked in with every guest throughout the course of the evening. It was obvious that their solicitous service did not end in our experience alone. I didn’t want to miss Jalama as I know as they are supporting Circle of Hope by pouring at the Vine 2 Wine Classic on August 17 (join us: http://circleofhopeinc.org/events/vine2wineclassic), Fiddlehead supported our WiSH Education Foundation tasting in the library this year with wine donations, I enjoyed Palmina at a LearnAboutWine event and Zotovich had the best Pinot Noir that I tasted at a Henry Wine Group event. It was prime time that I visited all of these! …an unsurpassed complimentary cooked-to-order hot breakfast each morning…complimentary drinks during our Happy Hour…Our rooms are home-like, and include large flat screen TV’s, pillow top mattresses and some even have leather recliners…premium ice cream available 24-hours in the Lobby…toiletries, DVD rentals (over 1000 DVD Library, including up-to-date new releases), complimentary laundry service (including detergents), daily passes to Walnut Pier Health Club and copies of USA Today. I was relaxed just thinking about the hotel but, I had to make dinner reservations. I tried the uber-popular Succulent and was told that they were booked, two months in advance, for the time I wanted. A pal suggested the new SY Kitchen in Santa Ynez that was created by the same people behind Bar Toscana. The website promised Italian fare served in a three-room (one is a porch) farmhouse. And the Facebook page had photos of the chef torching artichokes and plating chicken dishes…that did make my mouth water. From there we were to have tastings at Lincourt Vineyards, Rideau Vineyard and Buttonwood Farm Winery. Of these threes I hadn’t had Lincourt since a 2003 tasting via Valencia Wine Company and Rideau would be totally new to me! 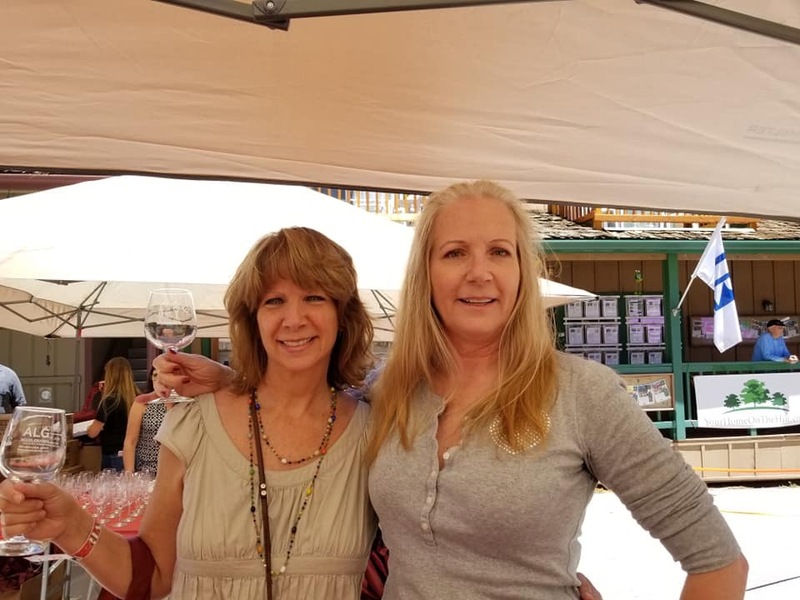 I had met and lunched with Buttonwood winemaker Karen Steinwachs via another LearnAboutWine event and looked forward to seeing her again – or at least her wines! So, in a very big nutshell, these are our plans. Once I take the trip I will report back via Twitter, Yelp, Trip Advisor, LinkedIn, Tumblr, Facebook, a website or print magazine and my Dear Wine Friend Newsletter because, what’s the point in tasting something great if you don’t shout about it??? We are an association of select boutique wineries located in the heard of the Santa Ynez, California. Each winery has a unique story , tasting room and selection of award winning wines for you to sample. Wine tasting in the Santa Ynez Valley offers an outstanding opportunity to try a variety of premium wines including (but not limited to!) Chardonnay, Sauvignon Blanc, Viognier, Cabernet Sauvignon, Pinot Noir, Syrah and Merlot. While visiting, discover the charm of the village of Los Olivos, rustic Santa Ynez and the quaint Danish village of Solvang. You can use our printable map to plan your next outing or just pick up a picnic lunch and head out to our wineries. Relax amidst the vines while taking in the ancient oaks stretching out over gently rolling hills. With a moderate climate, beautiful scenery and peaceful country living, the Santa Ynez Valley has become a wine tasting destination unlike any other. We hope you enjoy your visit and make sure to add Santa Ynez Valley Wine Country to your permanent list of delightful getaways. Our Association members are located throughout the Santa Ynez Valley. In Los Olivos: Alexander & Wayne, Arthur Earl, Cimarone & 3CV Wines, Daniel Gehrs Wines and Toretti Family Vineyards. In Solvang: Buttonwood Farm Winery, Casa Cassara, Lincourt Vineyards, Lucas & Lewellen, Rideau Vineyard and Toccata. In Santa Ynez: Imagine Wine and in Buellton: Standing Sun Wines. Santa Ynez Valley, California— One of the most celebrated times of year in the Santa Ynez Valley takes place from August through November. Harvest in the heart of Santa Barbara Wine Country is a revered season when visitors and locals can experience wine from grape to glass. To celebrate, Visit the Santa Ynez Valley has declared September “Santa Ynez Valley Wine Month” and will be honoring wine with events, classes, dinners, deals and packages. As part of California Wine Month, these events and promotions can be found in the towns of Buellton, Ballard, Los Alamos, Los Olivos, Santa Ynez, Solvang and the Lompoc Wine Ghetto. The unique offerings of SYV Wine Month are supported by several major sponsors: Santa Ynez Valley Hotel Association, Sunstone Winery, Sanford Winery, Figueroa Mountain Farmhouse and Coghlan Vineyard & Jewelers. Celebrate the marriage of wine and food throughout SYV Wine Month with dinners and food pairing events such as Brewer-Clifton’s Wine Country Luncheon at Machado Vineyard, an Effervescence Sparkling Wine release Brunch at the Sunstone Villa and the Second Annual Wine Club Dinner at Refugio Ranch. Special wine pairing menus will be offered by the Los Olivos Café & Wine Merchant in Los Olivos and Fresco Valley Café in Solvang or you can cook and be part of Buttonwood Winery’s Cookbook Club dinner. Taste something old and something new with vertical, library and special tasting flights at many wineries including Sanford, Cimarone & 3CV Wines, Wandering Dog Wine Bar, Mosby, Brewer-Clifton, Longoria, and Palmina. Take wine education to the next level with wine classes and seminars offered by Refugio Ranch and Brewer-Clifton. Then get a closer view of the wine country by taking a tour through the vineyards or a behind-the-scenes tour of a winery. Avant in Buellton will be offering a Winemaker’s Tour and lunch on three different Saturdays in September. 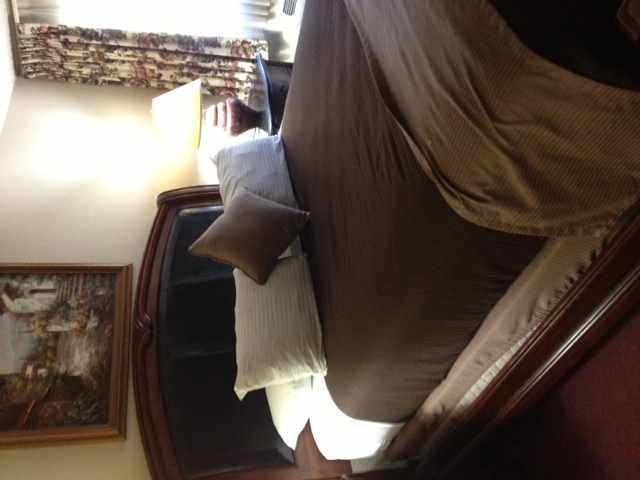 After all that wine drinking you’ll want a comfortable place to stay and relax. Visitors can take advantage of terrific packages or deals offered by hotels such as the Wine Valley Inn, ForFriends Inn, Fess Parker Wine Country Inn, Pea Soup Andersen’s Inn, King Frederik Inn and Ballard Inn. Figueroa Mountain Farmhouse will also offer specials to visitors looking for a private estate. Don’t forget to pick up a souvenir during your stay. Cimarone Wines is offering a 6-pack special and Coghlan Vineyard & Jewelers is donating 50% of all sales (including tastings) to Arts Outreach, a nonprofit supporting the arts for children. 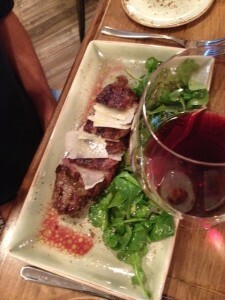 For a complete listing of Wine Month events, tasting rooms and deals, visit www.SYVwine.com. Plan your trip to the Santa Ynez Valley, view, download or order a Visitors Guide with a wine tasting map at www.visitthesantaynezvalley.com.